Larger fuel tank for Speedsters? Can the small fuel tank being installed by a few makers of Speedsters be replaced with this larger 12 gal. 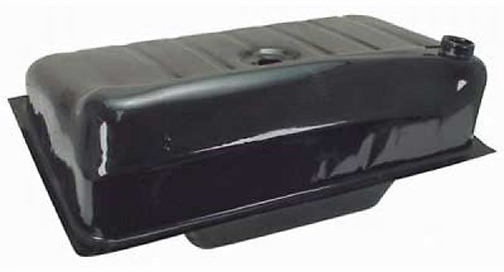 fuel tank being offered on *eBay. . . without having to make major structural changes to the front trunk? *Note: I was recently told that this larger tank is similar to the one Vintage Speedsters in Scottsdale, AZ has started using in all their speedsters. I put one in my CMC and it fit fine. You need to buy their gas cap as it is different than VW one (as noted in ad). I did NOT have to clearance the inner engine lid liner - hood closes with absolutely no interference. The temp space saver spare will no longer fit. I bought mine from CIP1 but it says it's 12.5 gallon capacity. Do you lose the space for the spare tire or will it still fit with the larger tank? It's too tall for a Beck. I think if I went to a smaller battery or lowered the battery box a couple inches, the CMC recommended size T tire (on a 15" x 4" rim) would fit. I've also thought of moving the battery in the nose just in front of the passenger's tire (behind the horn grill). I put one in my CMC and it fits without any extra clearance issues. I do not carry a spare, but I do carry two cans of fix a flat... I am also going to add a small compressor to the tools on board. mine fit fine in VS but U should get tank cleaned first(radiator shop?) its coated on inside with something that disintegrates and plays havoc with the jets...even with 3 filters from tank. A 12 gallon gas tank in a car that gets around 20 miles per gallon (your mileage may vary) will have a potential minimum cruising rage of 240 miles. OK, serious question, how many of you can drive your car for a 240+ mile stretch without needing to stop and take a pi$$? A 10 gallon tank gives me enough cruising range to cover most distances between any potential fuel/rest stops. Use the call of-nature-measure to determine if you really need a 12 gallon tank and all the time-effort-money to install it (and lose the option of carrying a spare tire). What Jim said 100%. I am always ready for a pit stop and a stretch at 175 miles. And love having a spare too. I've got a big tank and go 250 mi +/- between fill ups. At 80 mph, that's about 3 hrs. If I were El Guapo, livin' la vida loca on the best coast, I'd cruise up and down the PCH and stop every couple of hours, too. But when I'm Interstaten', I'm just trying to teleport to the next 93 octane oasis, hopefully 250 mi +/- down the road. For this flatlander, everything east of Denver and west of Huntington, WV is just laying down miles. I also carry a spare tire. It's a 3" wide-5 AL drag wheel and space saver spare. It nestles nicely down in the nose, over the battery. Rusty wrote: I sure would like to lose my spare tire... 73 degrees here today in the mountains of West Virginia that is highly unusual as snow is usually asre deep to a tall Indian ...We went to Dairy Queen and shot my 4 day old diet all to hell .